Contact: Shane D. Boone, HRDI-60, 202-493-3064. This program roadmap presents a list of prioritized nondestructive evaluation (NDE) needs for the United States highway infrastructure as identified by a group of nationally recognized NDE and structural health monitoring (SHM) experts. On September 27th and 28th, 2012, the Federal Highway Administration’s (FHWA’s) Office of Infrastructure Research and Development (R&D) held a 2-day workshop in Alexandria, VA, with the purpose of developing a list of prioritized needs regarding nondestructive evaluation for the United States highway infrastructure. This list will be used to determine new research and development activities required to develop a new strategic vision and roadmap for the program. The FHWA Nondestructive Evaluation Technical Working Group (TWG) workshop included nationally recognized experts in the fields of NDE and SHM from Federal and State departments of transportation (DOTs), academia, and industry. This document presents the list of prioritized needs identified by the workshop. The NDE Program established in 1996 at Turner-Fairbank Highway Research Center conducts FHWA NDE R&D. Historically, the goals of the program have been to improve the state of the practice for inspection and evaluation of the transportation infrastructure, which includes bridges, tunnels, pavements, and ancillary features such as sign posts and high-mast lighting. The original intent for the program was to act as a resource for State transportation agencies, industry, consultants, and academia concerned with the development, testing, and deployment of innovative NDE technologies. The current NDE Program has provided State highway agencies with independent evaluation and validation of NDE technologies, developed new sensor technologies, and supplied technical assistance to States exploring the use of these advanced technologies. The program also has applied these technologies in selected situations to assist the States in examining the nature and causes of anomalies or failures of in-service bridges and other ancillary structures. The Nondestructive Evaluation Laboratory, which manages the NDE Program, however, did and does not provide specific testing services nor is it a venue to gain formal approvals of equipment and/or methodologies for work with State DOTs. The FHWA conducted the NDE Program in partnership with State transportation agencies, industry, consultants, and academia. While addressing the critical needs of the greater transportation community, the program also focused on developing solutions to meet the performance goals of the FHWA Infrastructure Inspection and Management Team; the overall goals of the FHWA Office of Research, Development, and Technology; the strategic goals of FHWA, and the overall mission of the United States Department of Transportation (USDOT). The goal of the TWG workshop was to create a list of prioritized NDE needs for the Nation’s infrastructure for use in developing an updated strategic vision and roadmap for the FHWA NDE Program. The TWG identified these needs via presentation of existing and new NDE and structural health monitoring (SHM) methods, techniques, and technologies, along with in depth discussions by nationally recognized experts. The new FHWA NDE Program vision and roadmap should be one that allows the program to continue to improve upon its original goals while simultaneously developing a new vision to lead the NDE community for infrastructure health, maintenance, and repair. The vision and roadmap should include objectives that assist the Long-Term Bridge Performance (LTBP) Program in its long- and short-term goals, and should provide methods to assist States, industry, and academia with their NDE needs. Finally, the vision and roadmap should include the ways and means to reach out to other industries for future development of NDE of structural components, materials, and systems while ultimately satisfying the missions of FHWA and USDOT. ...Serve the United States by ensuring a fast, safe, efficient, accessible, and convenient transportation system that meets our vital national interests and enhances the quality of life of the American people, today and into the future…. State of Good Repair – Ensure the United States proactively maintains its critical transportation infrastructure in a state of good repair. Livable Communities – Foster livable communities through place-based policies and investments that increase transportation choices and access to transportation services. National Leadership – FHWA leads in developing and advocating solutions to national transportation needs. System Performance – The Nation’s highway system provides safe, reliable, effective, and sustainable mobility for all users. Program Delivery – FHWA programs are delivered effectively and consistently through successful partnerships, value-added stewardship, and risk-based oversight. Corporate Capacity – Organizational resources are optimally deployed to meet today’s and tomorrow’s mission. Finally, the FHWA Office of Infrastructure R&D conducts and oversees research and development programs and projects that address critical highway infrastructure needs and priorities of national importance to meet the strategic objectives of the FHWA. The projects and studies focus on the design, materials, construction, operation, and preservation of highway pavements, bridges, culverts, tunnels, and other structures. In addition, the Office of Infrastructure R&D provides expert technical assistance to other FHWA offices, other Federal agencies, State and local transportation organizations, industry, and academia. Through an integrated and interdisciplinary research approach, the Office of Infrastructure R&D provides state-of-the-art knowledge and tools with the goal of improving the safety, performance, and cost effectiveness of the Nation’s highway infrastructure, while minimizing the impacts that highway construction, operations, maintenance, and rehabilitation may have on the environment. The contributions of stakeholders from across the highway infrastructure spectrum in the development and execution of multiyear R&D plans and roadmaps are key to the success of the program4. Thus, in order for the FHWA NDE Program to meet the needs, goals, and missions of the Office of Infrastructure R&D, FHWA, and the USDOT, its strategic vision and roadmap should be aligned with and fully support FHWA’s goals and priorities. 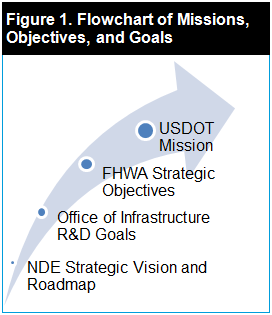 By meeting FHWA’s strategic objectives, the program will inherently meet those of the USDOT (figure 1). The strategic vision and roadmap for the program should help ensure system performance and provide national leadership by developing, testing, and deploying innovative NDE technologies. The technologies should address critical conditions and weaknesses in the physical infrastructure that diminish the capacity of the transportation system and/or increase the risk of failure of bridges, pavements, and other structures that might decrease safety and/or mobility. The program should be a leader in developing solutions, demonstrating the effectiveness of those solutions, and partnering with other stakeholders to ensure that proper training is available to implement those solutions effectively. Organizational resources should be optimized by working with FHWA’s partners and stakeholders to identify the highest priority needs, leveraging resources and knowledge to develop solutions, and reevaluating priorities continually as circumstances change. Historically, the research emphasis of the FHWA NDE Program focused on condition evaluations and forensic analysis of bridge failures with some relatively minor research in pavement NDE. The bridge NDE research involved technology evaluation for quality assurance and quality control of new bridges as well as condition assessment of in-service bridges and forensic analysis when appropriate. The NDE activities conducted by the program involved NDE investigations of in-service bridges supporting the National Bridge Inspection Standard (NBIS) bridge inspection program, which is conducted by highway agencies. The program also performed research through special requests identified by State and Federal highway agencies. While visual inspection methods are the primary mode of inspection under the NBIS, numerous situations occur in which NDE provides the ability to detect problems that the eye cannot properly identify or effectively characterize, thus problems could potentially remain undetected. ...to conduct state-of-the-art research and testing of nondestructive testing systems and technologies to improve the Nation’s highway infrastructure. The original vision of the NDE Program was to provide advanced NDE research within the context of an integrated view of highway facilities, which include bridges, pavements, and other structures such as culverts, retaining walls, tunnels, sign structures, and high-mast lighting. These statements remain true of the FHWA NDE Program. With new research priorities identified by stakeholders, however, the program needs to incorporate new research and development goals. These goals should deliver the program into the future, work side by side with the Long-Term Bridge Performance Program, and provide substantial training and tools to stakeholders. This new strategic vision and roadmap, therefore, will broaden the NDE Program’s current mission and redefine its objectives while simultaneously defining a clear path forward for the future research of NDE at FHWA. The FHWA NDE TWG workshop attendees identified NDE technologies, methods, and goals as well as the pressing needs of the current and future national infrastructure inventory. With these existing technologies and needs recognized, specific activities will be identified that will aid in the prioritization of actions and the development of overall goals for the FHWA NDE Program. 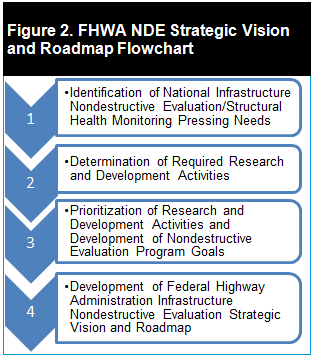 The strategic vision and roadmap will be drafted from these prioritized actions and goals to satisfy the strategic goals of FHWA and allow the Agency’s NDE Program to continue to be a national leader in the field of infrastructure NDE and SHM in figure 2. The workshop produced a list of 14 pressing needs for the Nation’s highway infrastructure. These needs were developed via presentations and in-depth discussions by nationally recognized NDE experts from FHWA, State DOTs, academia, and industry and were then prioritized in table 1. The list does not identify specific actions for the FHWA NDE Program, but only identifies the needs of the national infrastructure regarding NDE and SHM. The FHWA NDE Program assembled a group of nationally recognized experts in the field of NDE from Federal and State DOTs, academia, and industry with the intent of developing a list of prioritized NDE needs for the highway infrastructure of the United States. The list was developed from presentations and in-depth discussions. The FHWA will use the list to identify research and development activities required to develop a strategic vision and roadmap for the FHWA NDE Program. For additional information, contact Shane D. Boone, Office of Infrastructure R&D, 6300 Georgetown Pike, McLean, VA 22101-2296; 202-493-3064. Table 1. Prioritized National Highway Infrastructure Nondestructive Evaluation and Structural Health Monitoring Needs. 1 Provide NDE education and training/certification. 2 Develop a NDE validation center for material and real bridge level specimens. 3 Standardize NDE procedures and protocols. 4 Create bridge condition and reference baseline data for quality assurance. 5 Overcome the limitations of existing NDE and identify methods to address these limitations. 6 Determine cost benefit analysis of NDE. 7 Develop decision making/risk-based analysis framework to help put NDE in the design, maintenance, inspection, and repair process (incentives for States). 8 Determine the probability of detection for different NDE techniques. 9 Incorporate maintenance and inspection into the design process. 10 Create improved methods for data visualization and presentation. 11 Implement a data/technology repository. 12	 Create improved methods for data fusion and combination of techniques. 13 Identify mature technologies and develop an applicability and deployability matrix. 14 Identify limitations of visual inspection and identify easier methods to determine when NDE is required. Researchers—This document was produced by the Federal Highway Administration. Distribution—This roadmap summary is being distributed according to a standard distribution. Direct distribution is being made to the FHWA divisions and Resource Center. Availability—The document will be available in spring 2013 and may be obtained from the FHWA Product Distribution Center by email to report.center@fhwa.dot.gov. Key Words—Nondestructive Evaluation Program, NDE, Roadmap, Structural Health Monitoring, Bridge, Highway, Infrastructure. Keywords: research, infrastructure, pavements and materials, Nondestructive Evaluation Program, NDE, Roadmap, Structural Health Monitoring, Bridge, Highway, Infrastructure.